Each year, about 8,000 patients in the United States and 40,000 worldwide are diagnosed with ALK-positive non-small cell lung cancer (NSCLC). This type of cancer involves molecular alteration to the anaplastic lymphoma kinase (ALK) gene that drives the formation of a tumor in the lung and is the focus of Dr. Jin’s research at the Mayo Clinic. Dr. Jen and her team analyze the genetics of early-age cancer onset and lung cancers in non-smokers. With NFCR’s support, Dr. Jen and her team of scientists worked to develop a new approach to treat patients whose ALK-positive cancer became resistant to the target therapy crizotinib (Xalkori®). The team took tumor biopsies from patients whose ALK-positive tumors recurred and performed a next generation sequencing analysis to look for any new mutations that could be responsible for tumor resistance. Dr. Jen’s team then identified which genetic changes are associated with crizotinib resistance. The next step for Dr. Jen is identifying existing drugs that can target specific mutations identified during the genetic analysis. After that, the research obtained can help doctors create personalized prescriptions for each patient based on their unique genetic profile. Jin Jen, M.D., Ph.D. attended Beijing Medical University and received her Ph.D. from the University of California. 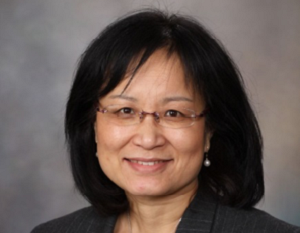 She completed her postdoctoral fellowship in oncology at the Johns Hopkins University School of Medicine before joining the faculty at the Mayo Clinic as an associate professor of medicine. Dr. Jen is now a leading lung cancer researcher with extensive experience in genetic and gene expression analysis. She is a Principle Member of the Biomarker Discovery Program at the Mayo Center for Individualized Medicine. Throughout her career, Dr. Jen has authored or co-authored of more than 100 manuscripts, published more than 133 papers and invented five published patents. She has also been awarded the 1991 Environmental Mutagen Society’s Alexander Hollaender Student Award and the 1997 James Valvano Award for Cancer Research. Your ticket for the: Jin Jen, M.D., Ph.D.